Register Log In ECN Forum Forums Non-US Electrical Systems & Trades old Aussie/NZ mains plugs? Any idea where old Aussie plugs/sockets/switches like these might still be found? Trumpy, IIRC, you said a long while back you had some lying around? Can any of the mods put this on the ECN server itself just in case the image is removed? Thanks. Yes I did say that and I've more than likely still got them too. Biggest task is going to be finding them, as they'll be rather well hidden these days. There's been a few "Spring Cleaning's" since I made that statement. For those that are interested, these are the first plugs that came out here when NZ first got Electrical supplies in the home. As you can see from the photo, they are made from Alabaster, a form of Bakelite. I'm afraid the news isn't good. I've turned the house upside-down trying to find the box of old plugs and stuff I had here. But I can't seem to find it anywhere, I must have thrown it out a while back. Oh well, thanks Mike for your help. I've got some 10A light switches made from bakelite. 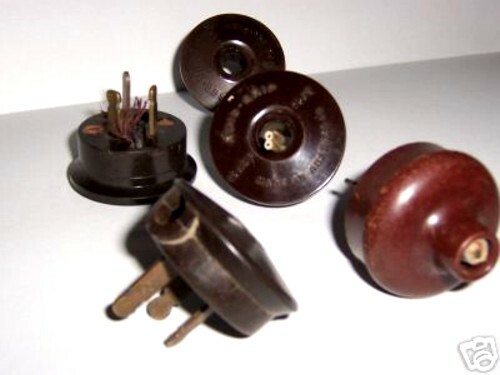 The bakelite electrical accessories are from a quaint period in Australasias history when electricity was still a novelty. I see these plugs sometimes. Usually on an old "Wireless" or an ancient heater in elderly folks houses. I will certainly send one to you next time I replace one. I see 4 Ring Grip plugs and HPM's first attempt at a side entry plug there from the late 40's/50's. I'm a chronic hoarder of things old and such fittings look the part in my 1931 wired house with split seam steel conduit and fabric covered VIR wiring I've got dozens of bakelite plugs, polarity reversing double adaptors and other currently 'frowned upon' fittings in use. You get boxes of bakelite fittings like that at the various markets/swap meets/junk shops here. We won't mention the first generation of HPM plugs will we...the ones where a loose strand of wire pokes out from beneath. I received my first shock off one of those! You get boxes of bakelite fittings like that at the various markets/swap meets/junk shops here. Same here in England. Junk shops can be a treasure-trove for old electrical fittings.